A lot of people have been trying to figure out the proper way on how to make Instant Pot steel cut oats without getting that dreaded burn message. Well, here is a healthy and delicious breakfast idea that looks as great as it tastes! The nice thing about these Instant Pot steel cut oats is you can pretty much set it and forget it while it cooks, so you won’t get a burn message at all. I’m always telling people to try to use the Instant Pot like you would a wooden spoon. Use it for everything, and not just to dump and cook food in. I love having the convenience of my Instant Pot to make a lot of my recipes in, especially when I’m having to take care of numerous things at once. The Instant Pot helps me to keep on with my multi-tasking life, and making breakfast in is no different. I love it! With all of my recipes, I use the Instant Pot 6 QT Duo 9-in-1 model. I have to be honest. When I first came across steel cut oats, I had no idea in what people were talking about. Was this a new fad that I didn’t know about and had to run to store and get before they sold out? Then I learned that there was a HUGE difference between rolled oats and steel cut oats. Rolled oats are what’s present in your Quick Oats and Instant Oatmeal packs that we get from the store. They’re so convenient to have on hand for a quick meal. Rolled Oats are groats that have been steamed cooked, rolled, and then dried. They cook much faster then steel cut oats; however, they tend to be more processed when you get to the instant oatmeal varieties. Steel cut oats are less processed. They literally take the oat groats, and cut them with a steel blade. This creates that slight couscous appearance because they are rough chopped. Since these oats aren’t as processed, they do take a little bit longer to cook. However, they have a much creamier profile, and are a bit chewier. learn how to make Instant Pot Steel cut oats the easy way! 1. 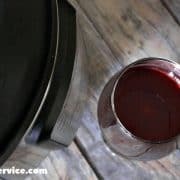 Spray the Instant Pot cooking container with non-stick cooking spray. 2. Add steel cut oats and water and stir to combine. Cover with lid and lock into position, then flip the pressure valve to the “Sealing” position. 3. Press the “Manual” or 'Pressure Cook" button and select the high heat setting. Set cook time to 10 minutes. After a brief pause, the Instant Pot will automatically start building pressure. 4. While the oats cook, combine yogurt, chia seeds, and maple syrup (optional) in a small bowl and stir to combine. Set aside. 5. When cook time is complete, turn off the Instant Pot to prevent scorching. Allow pressure to release naturally for 15 minutes, and then do a quick release for any remaining pressure. 6. Carefully remove lid and stir the contents to combine. Transfer the cooked oats to individual serving bowls. Heap the oats a little higher on one side of the bowl and spoon the yogurt mixture onto the other half. 7. Arrange the strawberries and blueberries between the two halves for a nice presentation. Serve immediately with additional maple syrup on the side, if desired. Enjoy! Toppings: In this method of learning how to make Instant Pot steel cut oats, I used a medley of fruits with a chia seed greek yogurt side. You can make this LOTS of different ways, and flavor it how you like! As far as nutritional values, there’s no real deviation between which variety of oats offer what. The different varieties carry approximately the same about of protein and fiber. 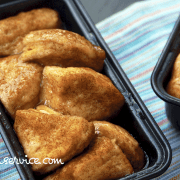 If you’re doing Weigh Watchers, this recipe contains 5 FreeStyle points per serving (without the addition of maple syrup)! If you decide to leave out the chia seeds with your yogurt, you will have a 4 FreeStyle point breakfast. You can then easily store the rest in storage containers for more breakfast varieties to have in the morning when you feel you don’t have time. 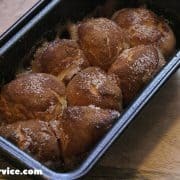 This is a perfect batch cooking recipe because these will last up to 6 days under refrigeration! Here are some more Weight Watchers Instant Pot Recipes that I know you’ll love!